AKA Wall Street, an extended stay “hotel residence,” was carved out of a 19 story brick and limestone office building built in 1907. 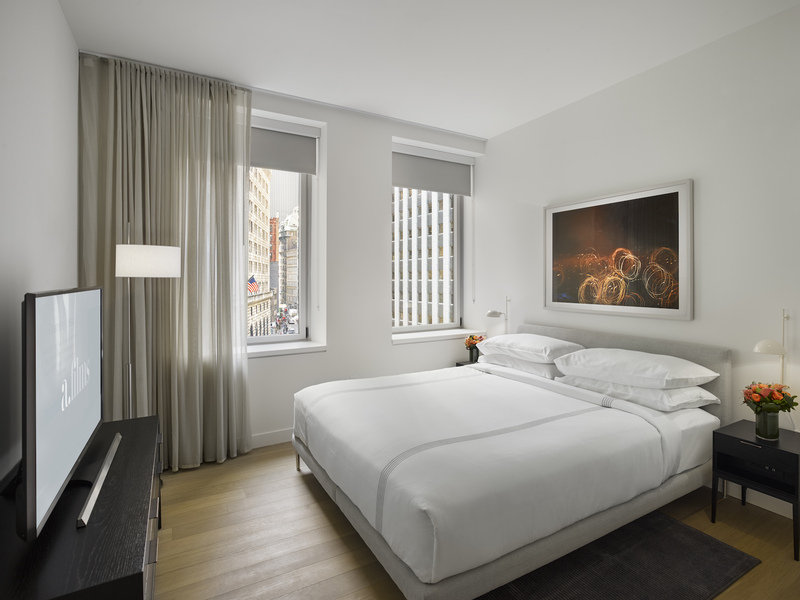 In New York City’s financial district, on the corner of William St. and Maiden Lane, AKA Wall Street is that rare kind of lodging that combines understated luxury for discerning travelers, attentive service, sleek modern design, a residential feel, and opportunities to engage in community life. 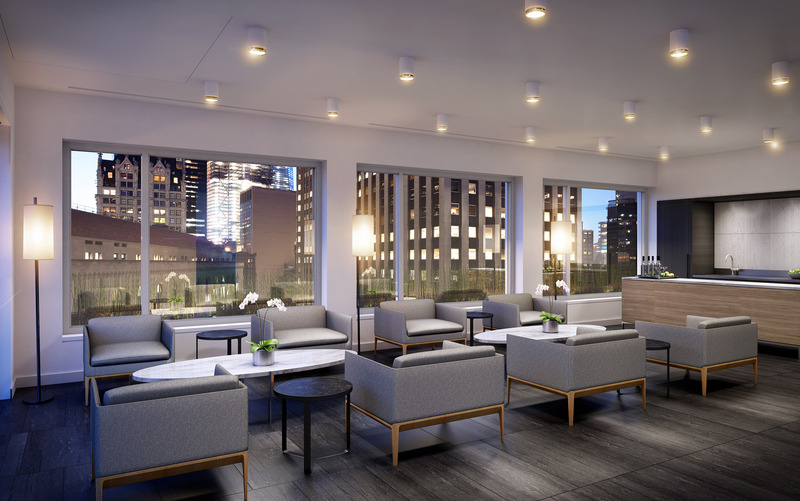 AKA, which has established Hotel Residences throughout NYC, Philly, Washington DC, Beverly Hills and worldwide, caters to short-term leisure travelers as well; individuals and families who opt to cook breakfast in the suite or provision out and eat in. 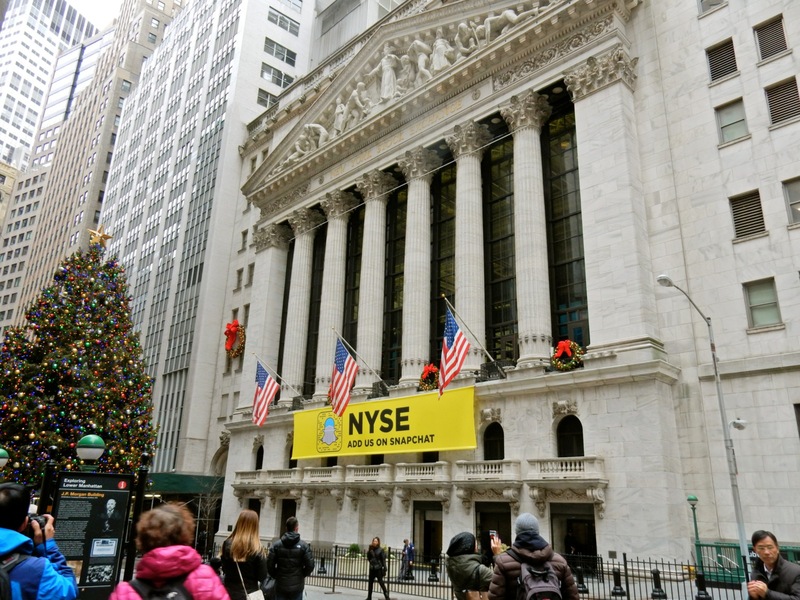 AKA Wall Street opened in June 2016 – so everything is fresh and new. Edward Asfour (Asfour Gurzy Architects) designed the interior in natural materials and light earth-tone palette, with a lobby so simple and Zen-like it’s quite the shock to walk in from the pageantry outside. 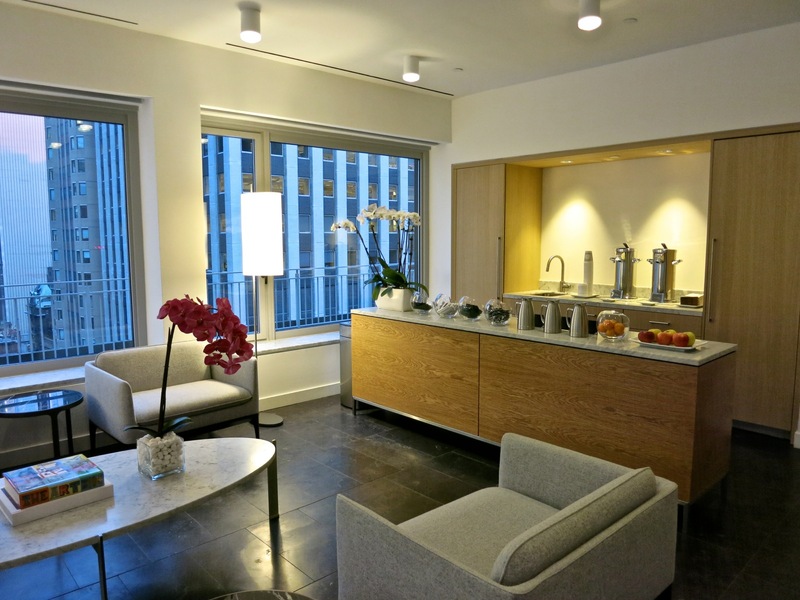 Stone-tile floor, expanse of espresso-brown cabinets behind an oak desk, the small space is more apartment lobby than busy hotel. Service is personable, whether you’re returning for the 25th day in a row or for the first time. 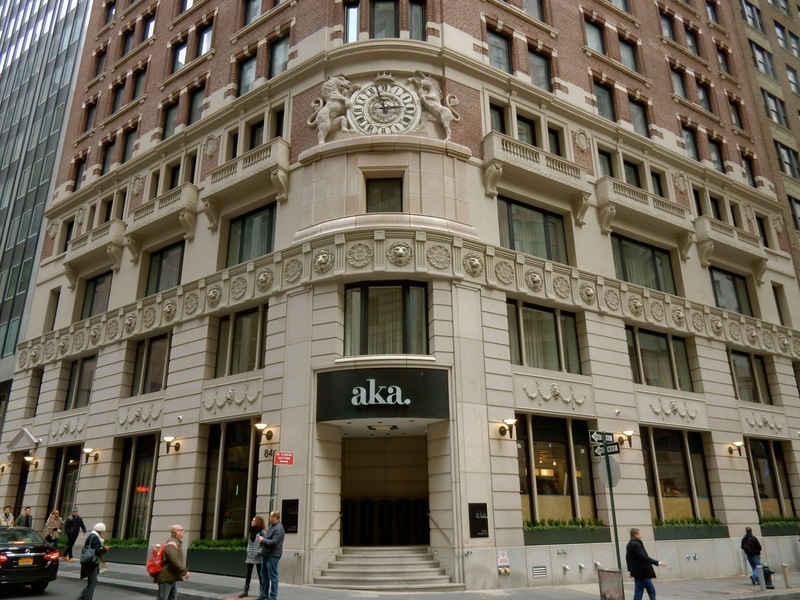 Unlike the more typical traditionally furnished long-term stay hotels, each suite at AKA Wall Street bears the mark of a Designs Within Reach showroom; clean lines, wide plank white-oak floors, mid century modern furniture, frosted glass sliding doors to gleaming glass-tiled bathroom (with large rain showers and ample light), abundant space for clothing and personal items in a massive closet, and two large flat-screen programmable TV’s (in one-bedroom suites). 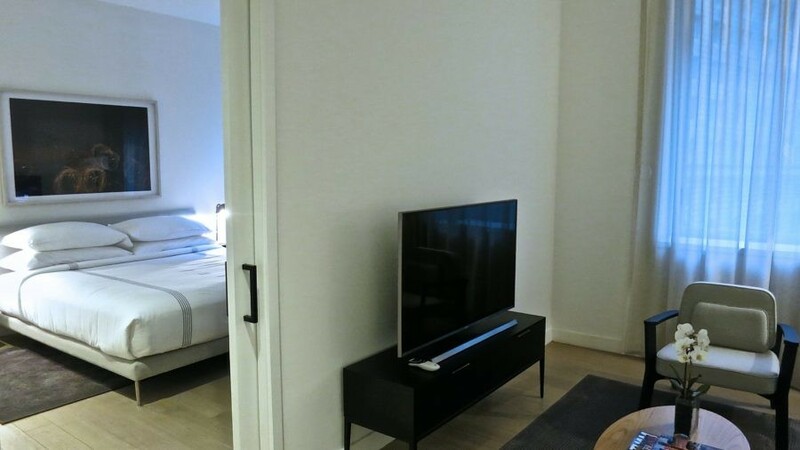 Comfy beds are handsome and crisp in white duvets. 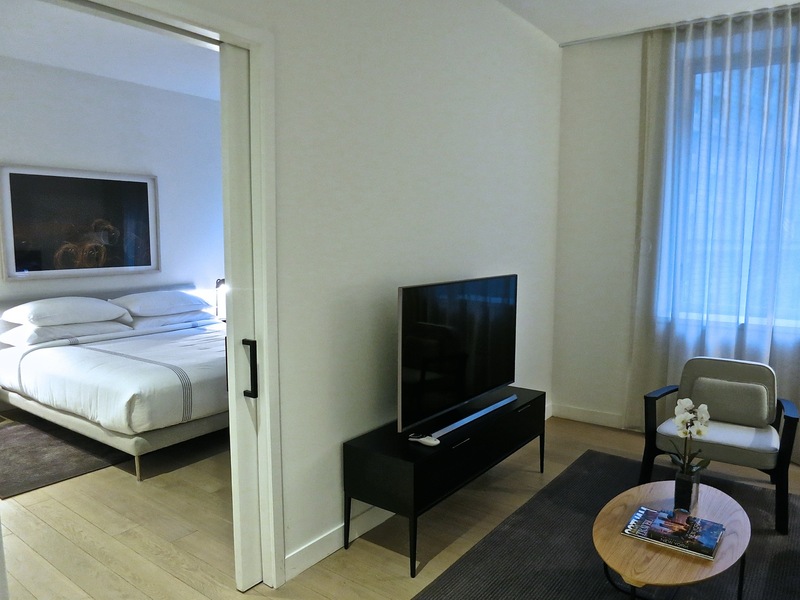 Aside from one piece of art behind the bed, rooms are minimalistic – right down to the eggshell-colored sheer curtains that swish to the side to reveal the canyons of commerce outside large windows. 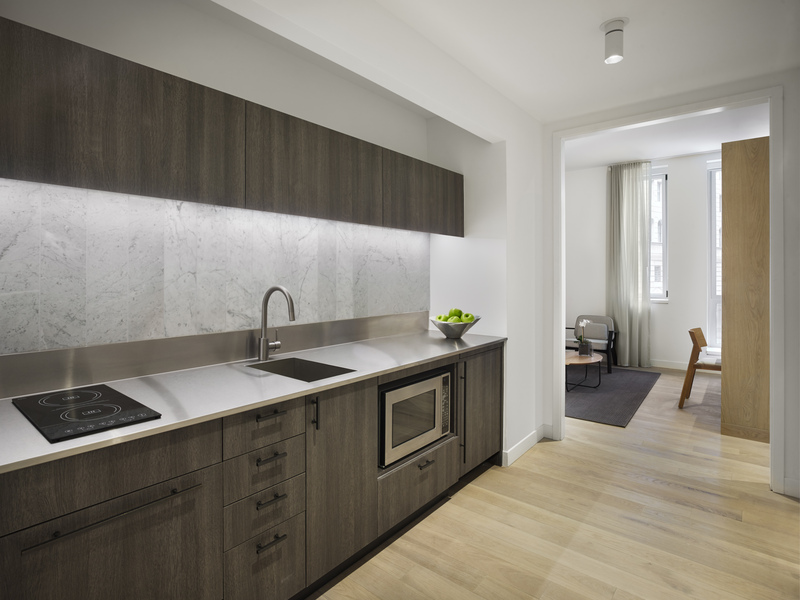 Modern Italian-designed galley kitchens are stocked with pots and pans, tableware, cutlery, glasses, induction-heating stovetop, microwave oven, Fisher-Paykel dishwasher (dishwashing pods provided! ), small fridge and ample counter prep room. Everything you need to prepare basic meals. 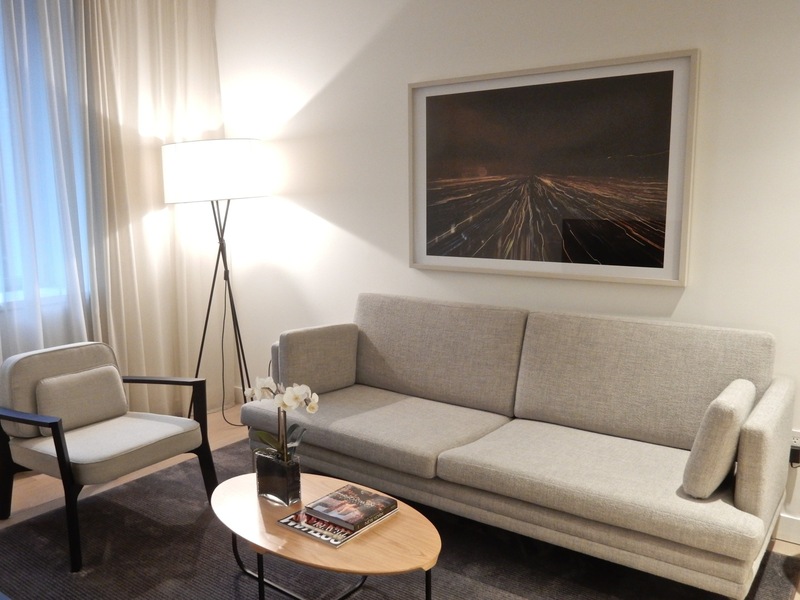 The sitting area can double as a dining room with enough room for 4 or more, but if you’re conducting a business meeting, there are dedicated rooms on the 2nd floor for that. 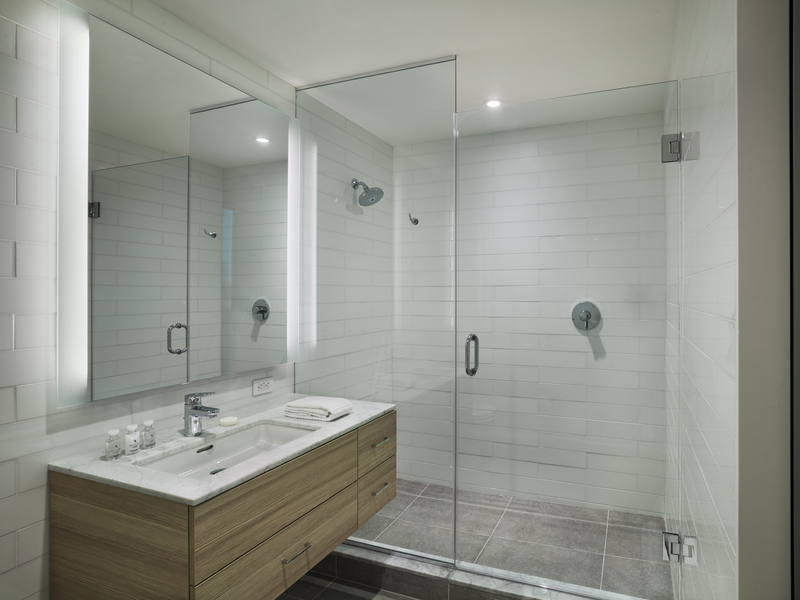 That’s where you’ll also find the laundry room – a necessity in any long stay away from home. On lower floors, you’ll feel the subway cars rumble beneath these harried streets. It’s just something you’ll get used to, and in fact, acts like a lullaby into the late hours. 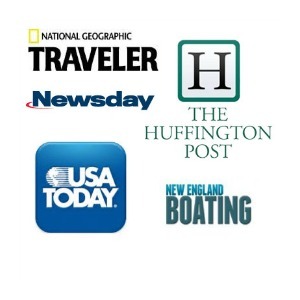 and AKA’s wonderful LiveIt Program, offering guests opportunities for neighborhood engagement – e.g. Wine Tastings, Cooking Classes, Dance (with Alvin Ailey Extension), Photography lessons, Improv Comedy and more. It’s anticipated that the Blue Ribbon Federal Grill will open in-house AKA Wall Street in early 2017. 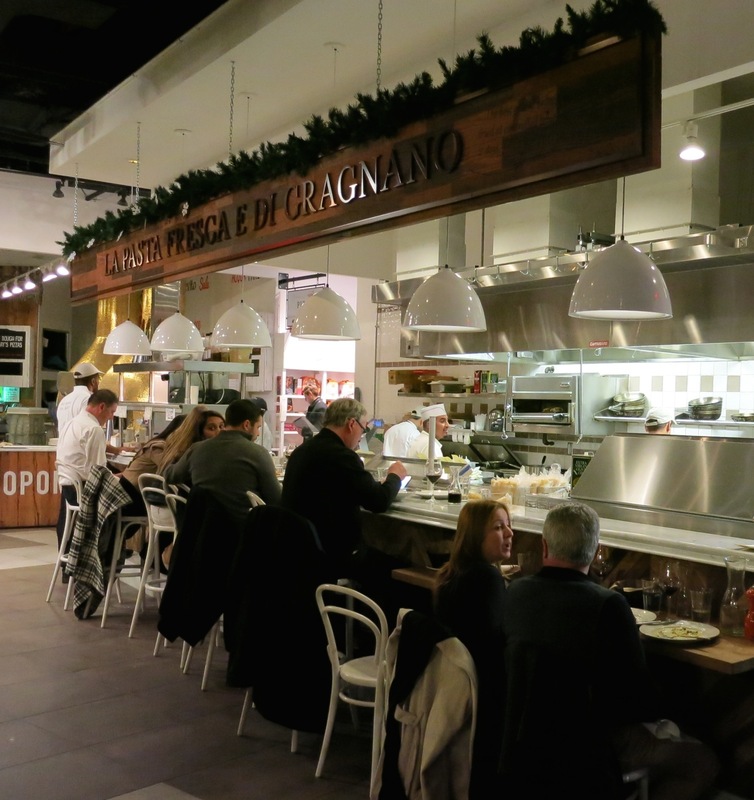 In the meantime, there are a slew of good restaurants in the neighborhood, most notably, Osteria della Pace in the brand new Eataly NYC Downtown. 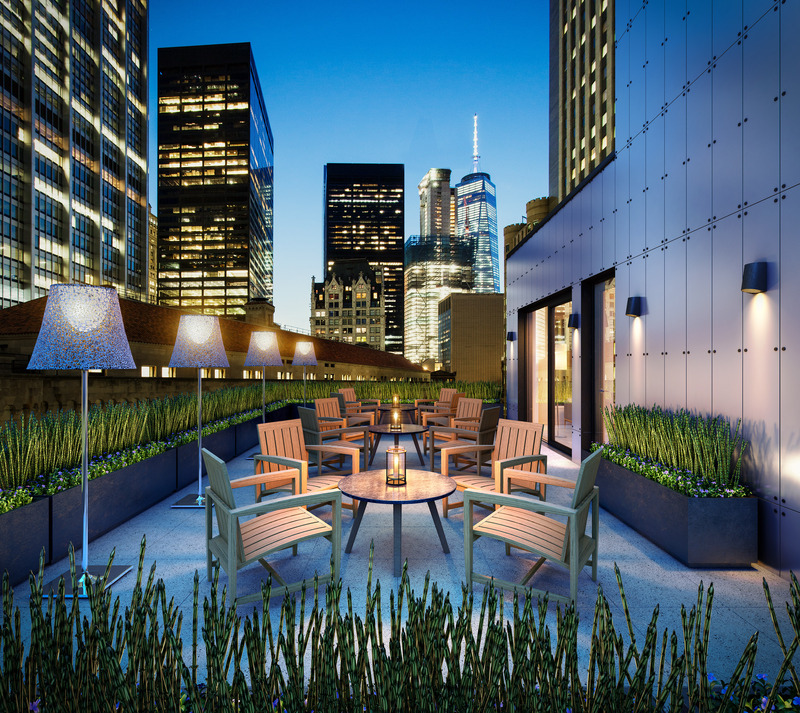 Just a five-minute walk from AKA Wall Street, Eataly – downtown’s new phenomenon (not to be confused with Eataly Flatiron) – takes up the whole second floor of the Four World Trade Center (101 Liberty St.). 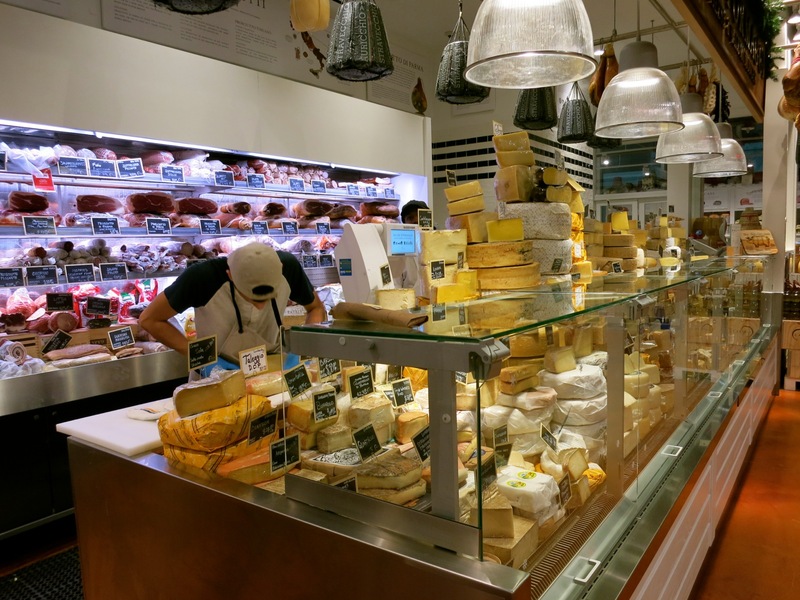 Even if you don’t intend to dine there, Eataly is an attraction in and of itself and the perfect place to pick up wine, cheese, breads and other picnic or recipe ingredients to whip up a quick meal in your AKA galley kitchen. 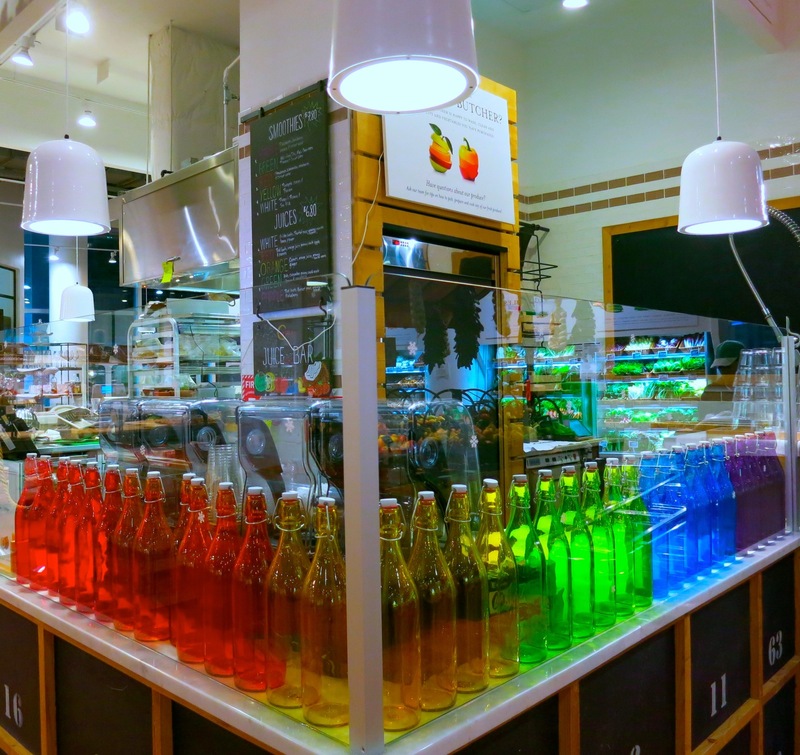 With everything from walls of cheese to charcuterie, biscotti, smoothies, juices, produce – an indoor market to end all markets – the restaurant Osteria della Pace is the most upscale eatery in Eataly. Excelling in homemade pastas and inventive tweaks on Southern Italy cuisine, with picture window views of those canyons of commerce, a radiant bar, toothsome wines from Italian family vineyards, and attentive waitstaff, Osteria della Pace is a new local hot spot for good reason. It’s here I found myself enjoying a wine-paired dinner, starting with the light and sparkling Monte Rosa Franciacorta Flamingo Brut (to whet the appetite), and followed by the fruity white Bastianich Vespa Bianco, and full-bodied 100% Sangiovese Antinori Pian della Vigne – perfectly mated with each course. As guests of AKA Wall Street, you’ll receive extra special VIP treatment – and samples of an assortment of unique wines from all over Italy to match your own menu picks. (Through its Live It Program, AKA sends guests to Eataly’s Il Vino Wine Bar and Shop for popular wine tastings as well). I cannot stress enough how outstanding the Royal Trumpet Mushroom Fritters with Burrata and Spicy Honey ($17) dish is. It’s an appetizer so tantalizing – a meld of earthy, crunchy ‘shrooms, melty cheese, and a hit of sweet and heat – I could have had it as a main meal and asked for more. The homemade Ziti with Slow-braised onion and Veal Ragu ($24) is also a favorite, though the menu changes every few months, so choose what you enjoy and by all means ask for advice. 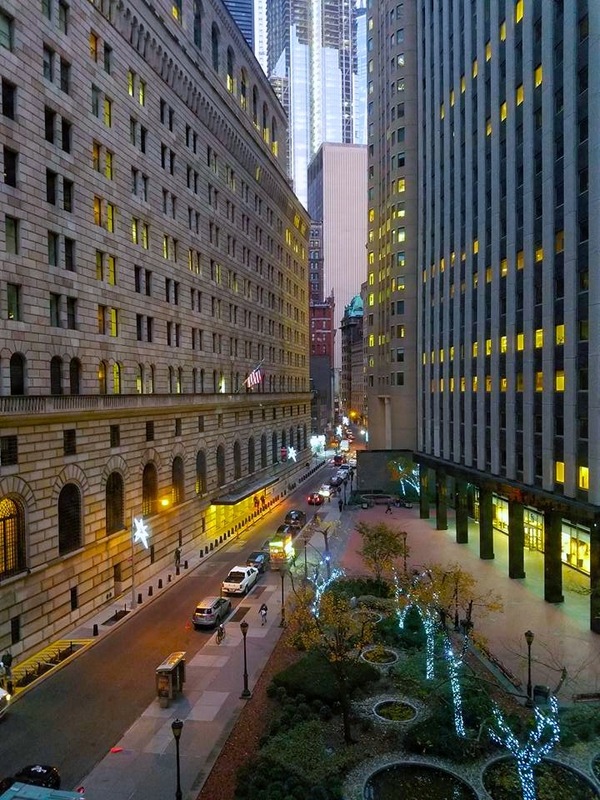 It’s just a couple of blocks to Wall St. – and what’s a stay here without seeing at least the façade of the New York Stock Exchange? No longer open for tours (post 9-11), you can soak in its ambiance from outside and just imagine the frenzy of the trading floor before computers took over. It’s especially ironic to view the NY Stock Exchange from the steps of Federal Hall National Memorial; especially from behind the statue of our first President, George Washington, who was inaugurated on this very site in 1789 (inside, you can see the stone balcony that Washington actually stood on, saved during the demolition of the first Federal Hall in 1812). 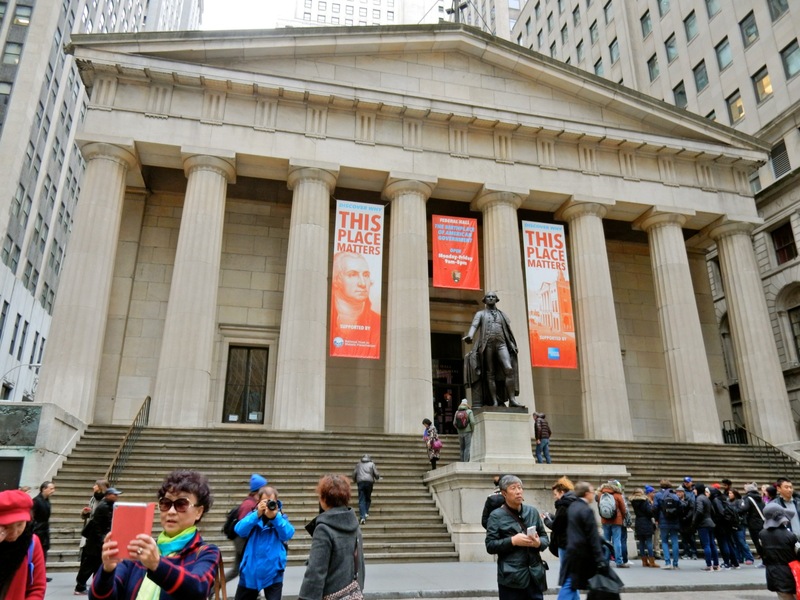 New York was our new nation’s first capital, with Federal Hall the seat of our new democracy, where the Founding Fathers gathered for the first Federal Congress. Perhaps it’s not so ironic that this building, erected in 1842 as the US Customs House, stands across from the Stock Exchange, a symbol of our Capitalist Democracy. In 1862 it evolved to become one of six U.S. Sub-Treasuries in the county. 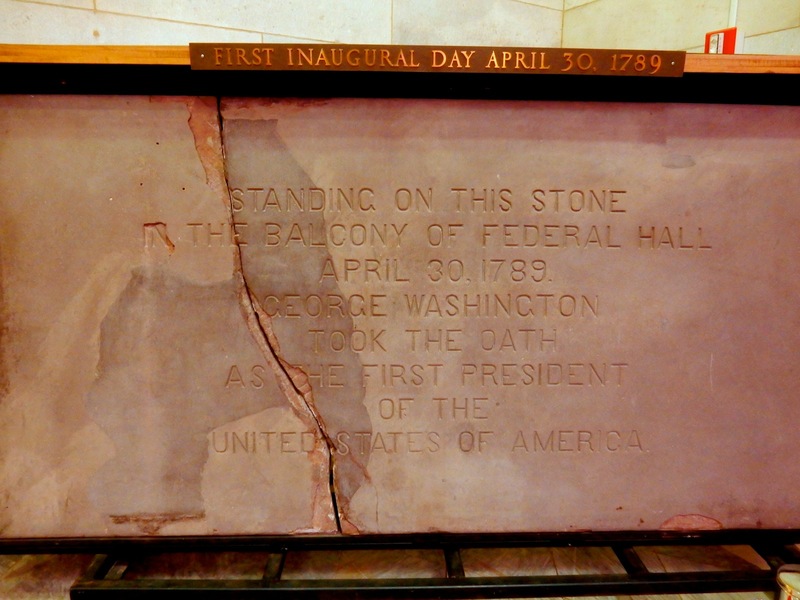 You can take a self-guided tour of Federal Hall, which, besides the first Presidential inauguration balcony, displays the very Bible on which George Washington was sworn into office, and an engaging timeline of history made here. Free entry. 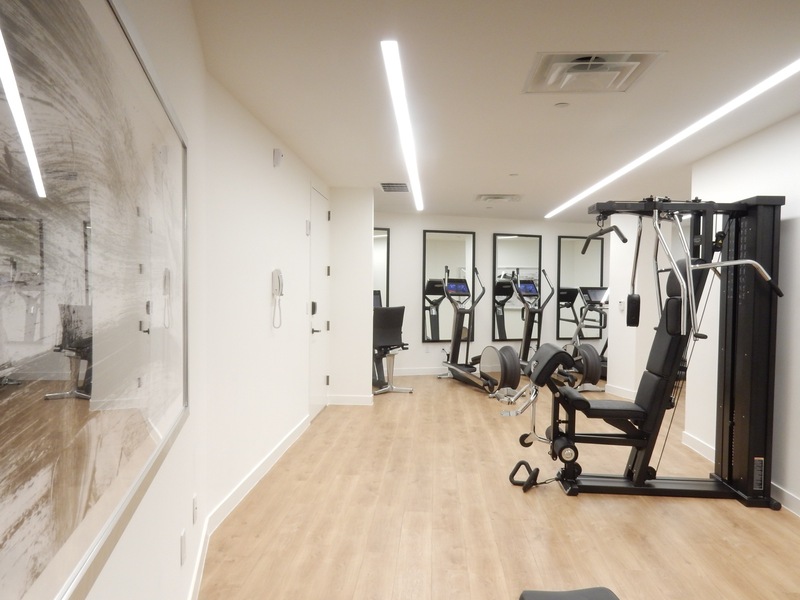 Suites from Studio to 2-bedrooms range in price from $260-$910 (rates stated are with tax) per night and includes wi-fi, use of fitness center, rooftop lounge, morning coffee.